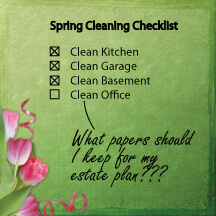 Spring Cleaning – Getting Your Documents Organized for Your Estate plan - Matlin Law Group, P.C. It is officially spring! When many of us awaken from our long winter hibernation just in time for annual spring cleaning, the perfect opportunity arrives to whip our homes and lives into shape. Ideally, estate planning is the perfect catalyst for organization. The more you know about what you own, the more complete your estate plan will be. Organizing your paperwork and your mind may seem like a daunting task, but the resulting relief and satisfaction are worthwhile from not only a practical but a psychological and emotional standpoint. An aversion to lawyers and arcane legal documents, or even a case of papyrophobia may leave you paralyzed. Perhaps a serious paperectomy is in order. If you cannot muster the organizational energy to sort your piles of paper, consider hiring someone or seeking the help of a professional, friend or relative. You will find it worth the effort and expense. Do not wait for a wake-up call – you may not get one. If the mere thought of planning your estate and all of the work entailed triggers panic, this questionnaire may get you on the right track. If such a detailed questionnaire is itself a major obstacle and you are meeting with a lawyer for the first time, ask the lawyer what s/he needs for a get-acquainted meeting. You may find that you can accomplish a lot with minimal advance preparation. Matlin & Associate, P.C. offers a free estate planning consultation. This consultation is a great opportunity for you to ask one of our attorneys what documents you may want to get organized. Please feel free to give us a call at 1-847-770-6600.